Turceni Unit 6 and 7 (electrofilter and building the canal that connects desulphurization installation with unit 6 and 7 – investment in progress). Oltenia’s IPO (initially scheduled to take place in 2014) has been postponed for 2015, as requested by the intermediary parties, BRD and Swiss Capital, who wanted to have the final report from the National Agency for Mineral Resources (NAMR) on Oltenia’s coal reserves. The evaluation of Oltenia’s coal reserves is conducted by Wardell Armstrong International and Geoconsulting Tg. Jiu and is expected to be finalized in February 2015. The process required more time because NAMR had to approve the declassification of data that shall be included in the report. Next (pre-IPO) steps: preparation of pre-marketing, book-building and roadshow studies. 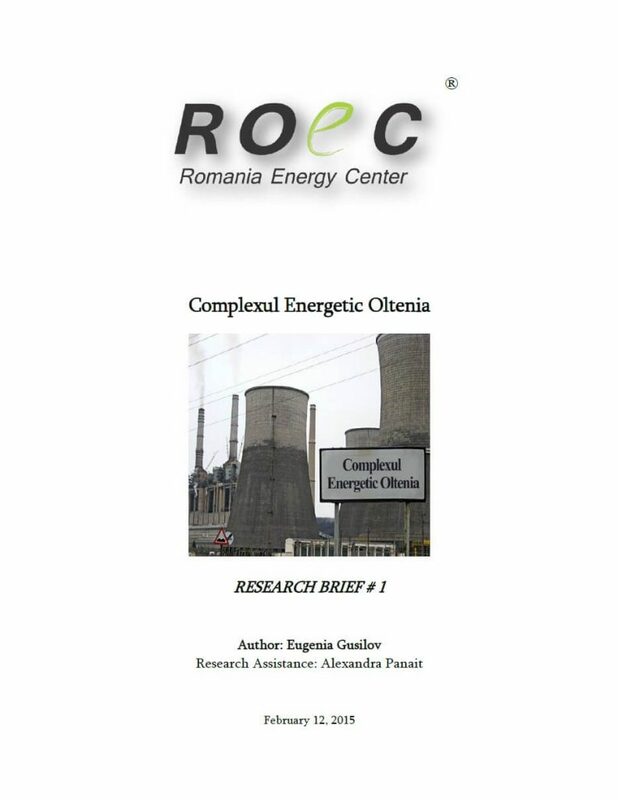 LATEST NEWS (February 2015): IMF insists on a “radical” restructuring of Complexul Energetic Oltenia which would leave only 5 power units active (top 5 most efficient ones): 3 units at Rovinari (3, 4, and 6) and 2 units at Turceni (4, 5). The IMF proposal was rejected by the Romanian government, and the topic of restructuring CEOltenia was postponed for April 2015.
modernized removal system of dense ash and slag slurry (since 2013). Unit 4 (1982) 330 MW Active electrofilter modernized; wet FGD installed and operational since 2011; modernized removal system of dense ash and slag slurry (since 2013). Unit 6 (1985) 330 MW Active electrofilter upgrade in progress, wet FGD installed in 2012; modernization of removal system of dense ash and slag slurry finalized. Unit 7 (1987) 330 MW Inactive electrofilter upgrade in progress. TURCENI was designed to be Romania’s biggest coal-fired power plant (2,640 MW initial projected capacity, 8 unit of 330 MW each), but only 7 units were built (2,310 MW final capacity). Unit 1 was put into operation in 1978, Unit 2 in 1979, and 5 units in each of the following years: 1981, 1982, 1983, 1985, 1987. Modernization of Units 3, 4, 5. 6 of Turceni TPP was completed in February 2013. It was supported by a 220 million EUR loan provided by the Japan Bank for International Cooperation (2005). Another 200 million EUR loan was provided by EBRD to Complexul Energetic Oltenia in February 2014 for modernization of Turceni Unit 6. Complexul Energetic Oltenia is reported to finance most of its investments through debt finance (bank loans) for which it guarantees with electricity supply contracts. Construction of the all 4 flue gas desulphurization (FGD) installations at Turceni was carried out by AE&E (Austrian Energy & Environment). The investment ensured the reduction of SOX from 4,000 mg/Nm3 to 200 mg/Nm3 and the dust concentration to less than 50 mg/Nm3. The FGD systems remove 96.4% of the SO2 and up to 80% of the fly ash from the boiler flue gas. Each boiler of units 3 through 6 is equipped with an absorber unit, and there is a total of two limestone slurry preparation lines for the four boilers. The flue gas SO2 absorption process produces a gypsum slurry that is pumped out to a subsequent dehydration process. Annually, 15,000 tons of commercial grade gypsum are produced. Unit 1 (1972) 200 MW Retired Here, on the former site of Unit 1 &2, China Huadian Engineering will build a brand new 500 MW unit. The agreement for this 1 billion USD investment was signed in October 2014. Construction is expected to start in 2015 and completed in 3 years (by 2017). For this purpose, a joint Chinese-Romanian IPP company will be set up in early 2015 (Romanian side to have only an in-kind contribution). Chinese partner insisted on rewriting the pre-feasibility and feasibility studies, although such studies were carried out by the Romanian side in 2010. Removal of dense ash and slag slurry (modernization finalized in 2009). Removal system of dense ash and slag slurry (modernization finalized in 2012). removal of dense ash and slag slurry (modernization finalized in 2009); an experimental deNOx system using urea injection was implemented only at Unit 6 (during 2012-2014). ROVINARI TPP now has a 1,320 MW current installed capacity (4 x 330 MW), of which 990 MW operational and 330 MW (unit 5) under modernization. Units 3, 4, 5, 6 were built between 1976 and 1979. Rovinari Units 3 & 6 are already compliant with the values required by the EU legislation (Directive 2010/75/EU) for emissions in 2016: dust concentration in the exhaust gas is below 50 mg/Nm3 and SO2 emissions are below 200 mg/Nm3. Objective: 4 modernized units by 2016 (Units 3, 4, 5, 6) and a new 500 MW (the Chinese unit) by 2017. Unit 7 (1967) 315 MW Active FGD put into operation on May 19, 2014. Unit 8 (1968) 315 MW Active FGD put into operation on June 2, 2014. Final installed capacity at this TPP was 1,035 MW. Modernization of Units 7 and 8 started in 2010 and was completed in 2014. The investment value for both units: 84 million euros. The modernization of removal system of dense ash and slag slurry was completed and is operational since 2010. (2015) In October 2014, construction of FGD installation was 70% ready. Estimated start date: spring 2015. CRAIOVA II is the newest/latest built TPP in Oltenia’s portfolio. It can supply electricity to over 350,000 households. The main business partner is Ford Romania, as Craiova II supplies the company heat for technological purposes as well as for heating purposes during winter. Craiova II employs 800 people and is the only TPP that has accessed EU funding for modernization works. The modernization of the removal system of dense ash and slag slurry was completed and is operational since 2010. 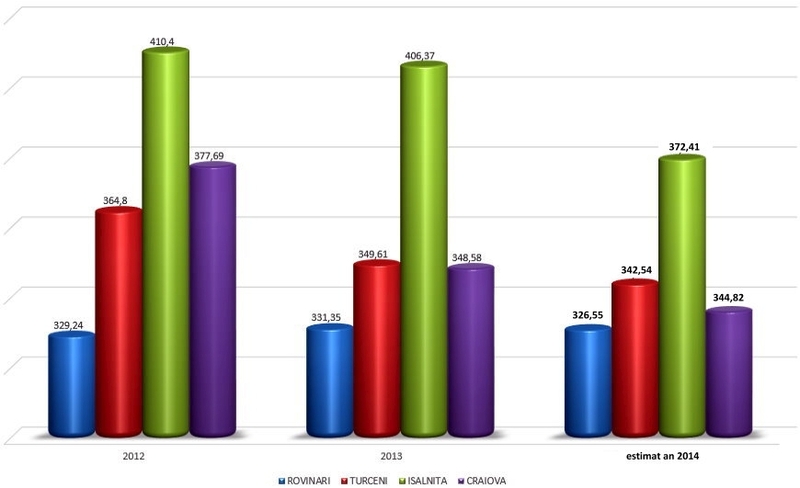 As shown in the 2 graphs above, the most efficient TPPs in Oltenia’s portfolio are Rovinari, Turceni and Craiova II (in that order), and the least efficient is Isalnita (Craiova I).